The Climate Reality Project is a grass-roots initiative dedicated to improving understanding and stopping global climate change by documenting its impacts on local communities throughout the world. 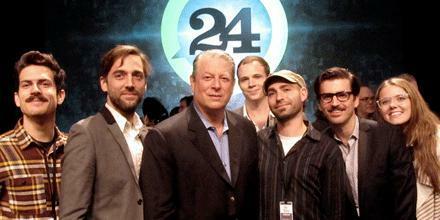 It was created by Nobel Prize Winner and former Vice-President Al Gore. It aims to accomplish these objectives by focusing on disseminating the facts about climate change in as many places and to as many people as possible. The hope is that after knowing what causes climate change and how to stop it citizens will take the steps needed to avert a climatic catastrophe. The Climate Reality Project achieves this by displaying real-time videography projects depicting the effects of climate change shown at varying locations. Each of these segments is approximately one hour long. The mantra of The Climate Reality Project’s mantra, according to their website, is that the climate crisis is real and we know how to solve it. It is presented at twenty-four locations over a timespan of twenty-four hours. Thus, this came out to once per hour. It was broadcasted starting on September 14, 2011 and concluded on September 15, 2011. In an effort to limit negative impacts on the environment these presentations were shown on The Climate Reality Project’s website. The presentations were conducted in thirteen languages. It was an overwhelming success. People hosted Climatic Reality Project watching parties spanning all ages and occupations. The Climate Reality Project did not end on September 15th. Currently this great advocacy group is attempting to expand their reach by offering to send trained presenters to groups who want to host gatherings advocating climate change prevention. A second avenue being pursued by The Climate Reality Project is linking with other climate preservation groups to expand the reach of climate protection activists at all levels from neighborhoods in Chile to multinational organizations working out of New York. A short introduction to the subject of climate change is necessary in order to understand the importance of this project. The Inter-Governmental Panel on Climate Change, a multinational workgroup of leading atmospheric and environmental scientists, reported in 2007 that there is irrefutable evidence that human activities are fundamentally altering global climate. The primary agent responsible for human-induced climate change is the production of greenhouse gases resulting from the use of fossil fuels including oil and coal. The use of these fuels and the resulting emissions, according to the Inter-Governmental Panel on Climate Change, is increasing the temperature at an unprecedented rate. This is resulting in increasing sea levels and frequencies of damaging weather events. Some concerns that represent the coal and oil industries have spent millions in an attempt to sway public opinion away from the consensus of the global scientific community of the need to find alternative sources of energy before the damage to the environment becomes irreversible. These special interests have engaged in a media blitz to get their message out.